The pilots of Ethiopian Airlines Flight 302 followed proper procedures before the March 10 flight that killed 157 people, according to a preliminary report by the Ethiopian government. “The crew performed all the procedures repeatedly provided by the manufacturer but was not able to control the aircraft,” Dagmawit Moges, Ethiopia’s Transport Minister, said at a new conference in Addis Ababa this morning. The pilots were flying the Boeing 737 Max-8, a new model of plane that has since been grounded worldwide over concerns that automation in the aircraft pushes the nose of the airplane down unnecessarily. The Maneuvering Characteristics Augmentation System (MCAS) lowers the nose of the plane when it believes that the airplane might stall. The preliminary findings are based on the aircraft’s black box, which was recovered from the crash site. In a press release posted online, Ethiopian Airlines said that the pilots followed both Boeing’s recommendations for handling the new planes as well as the FAA’s emergency procedures. It’s believed that the pilots disengaged the automation, just as they were supposed to do, but there are still a lot of unanswered questions about how many times the automated system re-engaged and whether the pilots themselves did it. Reuters reported yesterday that the automation may have re-engaged “as many as four times.” But we won’t have complete answers until the full report is out. “We will be reviewing the published report as it is released,” a Boeing spokesperson told Gizmodo over email without going into any more detail. The Ethiopian Airlines crash was the second of the 737 Max-8 planes to crash in five months. Lion Air Flight 610 crashed shortly after takeoff just off the coast of Indonesia on October 29, 2018. All 189 people on board died. Boeing has developed a software fix for the nosediving problem, but the FAA still needs to approve it. In the meantime, some of Boeing’s customers are trying to cancel orders for the 737 Max plane and hundreds of aircraft remain grounded. 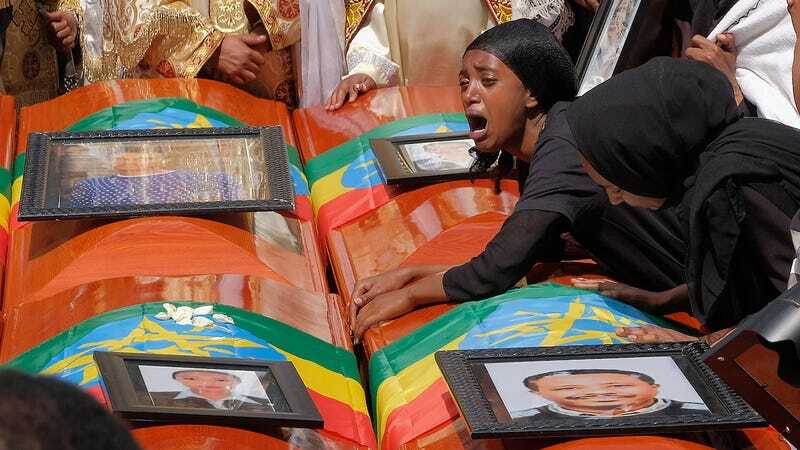 “All of us at Ethiopian Airlines are still going through deep mourning for the loss of our loved ones and we would like to express our deep sympathy and condolences for the families, relatives and friends of the victims,” CEO, Tewolde GebreMariam said in a statement.